By the will of God and the grace of the Holy Spirit at the regular Assembly of the Bishops of the Serbian Orthodox Church, held at the Patriarchate in Belgrade from May 14-25 2016, His Grace Dr. Mitrofan (Kodic), up to now the Bishop of Eastern America was chosen to be Bishop of Canada. His Grace Bishop of Eastern America Dr. Mitrophan (Kodic) was born in 1951 in the village of Ljusa, Sipovo, in Bosna. His elementary studies he completed in 1966 and the Seminary at Monastery Krka in 1971. He received the monastic tonsure on the eve of the feast of the Entrance of the Theotokos into the Temple in 1970 and on the following day was ordained as a hierodeacon by Bishop Stefan (Boca) of blessed memory. He completed the Theological Faculty in Bucharest, Romania in 1975. In 1977, after completing his studies, he was assigned as supplent of the Seminary of the Holy Three Hierarchs in Monastery Krka. He passed his professorship exam in 1979 and was assigned as assistant Rector of the Seminary at Monastery Krka in 1980 and as Rector in 1987. He was elected as a Vicar Bishop of Toplica in 1987 and appointed as assistant to the Administrator of the Diocese of Midwestern America, Dr. Sava of blessed memory. He was appointed as Administrator of the Diocese of Midwestern America in 1988, where he remained until he was appointed as Bishop of Eastern America in 1991. In 1997 Bishop Mitrophan successfully defended his doctoral dissertation at the Theological Faculty of the Serbian Orthodox Church in Belgrade on the theme: “The Mystery of Christ According to the Epistles to the Ephesians, Philippians and Colossians of the Holy Apostle Paul”. Besides the above mentioned dissertation, Bishop Mitrophan has published many theological works. 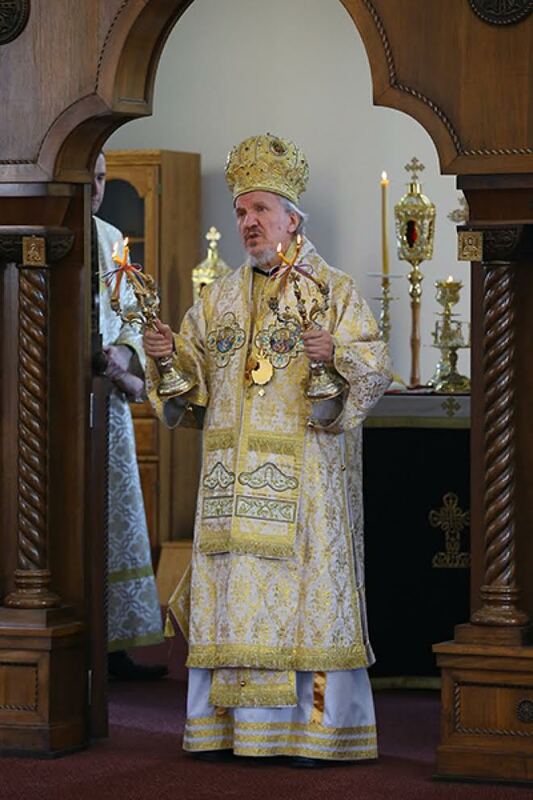 He translated from the Romanian, Professor Dr. Dumitru Staniloae’s “Community and Spirituality in the Orthodox Liturgy” three volumes of “Orthodox Dogmatics”, “The Immortal Image of God”, “Orthodox Moral Theology”. Also from Romanian he translated “The Romanian Patericon I and II” and the “Dictionary of Orthodox Theology” by Hieromonk Joankije Balan. His own book, “The Teaching of St. Apostle Paul on the Church” published in 1991 in Chicago, has been translated into English. His latest book “Introduction to the Holy Scriptures, the New Testament” has been released this year. Also, the translation of the book “The Gospel Image of Christ” by Professor Dr. Dumitru Staniloae is being prepared for print. Bishop Mitrophan is Professor of New Testament at the St. Sava School of Theology in Libertyville, Illinois.